Everyone knows that Valentine’s Day is a holiday when people show love family and friends. Some people send cards, candy or flowers to each other. But do you know how Valentine’s Day got its name? The ancient Romans dedicated February 14 as a day of love. On that day, Romans honored Juno, the goddess of women and marriage. If they praised Juno, Romans believed that the goddess would help young men and women find their future wives and husbands. On February 14, the boys each drew a girl’s name from a container. When all the girls’ names were picked the next day, each boy paired up with the girl whose name he chose for another holiday to honor the god Lupercus. Older adults hoped that each pair of boys and girls would fall in love during the festival. As Christianity spread across Europe, church officials didn’t want to honor the Roman gods, but they knew that the yearly celebration of love was very popular. In A.D. 486, Pope Gelasius replaced the Roman holiday with another festival. He named it after the Christian saint of love, Saint Valentine. Saint Valentine is a mysterious figure. Some historians think that at least three different people in history shared the name Valentine. 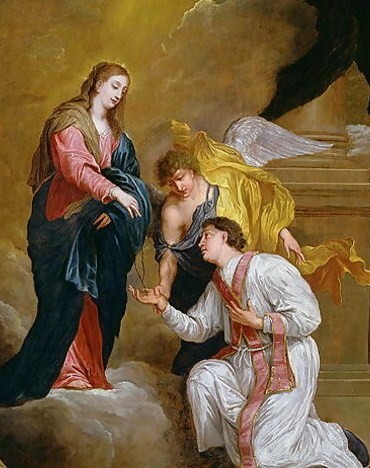 One legend says that Valentine was a Christian priest during the reign of Emperor Claudius II. Claudius had a hard time getting soldiers to fight his wars, so he forbid young men from marrying. Valentine disagreed with the emperor and performed secret marriages. When Claudius discovered Valentine’s actions, he threw the priest in jail. In this legend, Valentine was killed on February 14. In another legend, Emperor Claudius wanted everyone to pray to the Roman gods. Valentine refused because he believed in the Christian religion. Claudius imprisoned Valentine for his disobedience. While Valentine was in jail, he fell in love with the prison guard’s blind daughter and gave her a note before he was killed. Suddenly, the girl could see again. As time passed, people associated St. Valentine with lovers, and his day became a time when people hoped to find their sweethearts.